This mod aims to make Skyrim more exciting by adding a few acrobatic features, expanding the control of your character. Deathless Aphrodite - For the original Sprint-Jump idea. After many attempts, I've come up with a way to allow Sprint-Jumping with minimal lag. I've also Incorporated the functionality of a mod that gives you a, in-place boosted jump, when you want it. This mod includes an MCM menu which allows you to configure many options, including a configurable 'sneak camera', which changes the position of the camera while the player is sneaking. I realize other mods do this, but for me they never worked properly so I decided to integrate it as an optional feature. Just copy the files to your data folder. Then activate the mod in your launcher or NMM. When you load this mod, first check your MCM menu. There should be a new menu called "Acrobat". If this menu is not present, save your game, then load it and wait a few minutes. SKYUI should pop up a notification saying that a new MCM menu has been registered. Open the Acrobat menu to adjust settings and toggle features on and off. To Sprint Jump, you should first go to the Acrobat MCM menu and make sure your buttons are configured to your controls. Once you've done so, simply sprint, then hold the jump button. Your character will jump when you LET GO of the jump button. 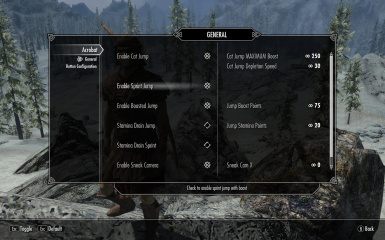 There is a minimum time you have to hold the jump button down, but it's different for every Skyrim installation, depending on your PC specs and mods. This feature will, when active, give you a Boosted Jump, when you sprint-jump. This allows you to sprint-jump over some city walls, and secretly enter bandit camps. Take your enemy by surprise! It's very useful when running from Giants and other large beasties. The Cat Jump is a feature which allows you to get a boosted jump, while standing in place. To use this, your character must be sneaking first. When you un-sneak, or stand up, then press the jump button, you will get a boosted jump. Keep in mind, you only have a certain amount of time to press the jump button if you want a boosted jump. This is useful for hopping over walls, jumping up mountains, and even stabbing dragons right out of the sky. This simply re-positions the camera while your character is sneaking. I made it for the 'sneak-crawl' animation, but you can turn it off in the MCM menu if you have no use for it.